No previous experience is required. Suitable for beginners or intermediates. Students should be able to have full use of both arms and hands. People with severely strained wrists or hands might struggle with the effort it takes to weave bigger withies. The course will be taught in a mixture of demonstration and application in the group, as well as question-and-answer discussion. Whilst we will follow the steps of the project together, there will be plenty of space for individual design wishes and own pace, with the tutor going around to lend individual support and feedback. General willow weaving techniques, English round base, staking up and upsett, joining, pairing weave and french randing, traditional border OR stepped finish with lashing of the pre-dried wooden handle. Also: all about the (few) necessary tools, hedgerow weaving, green vs. soaked material, sourcing material, storing and the soaking process. Your tutor will discuss the course content with the class and may make some adjustments to the syllabus based on the needs of the group. She will try to accommodate individual requirements where it is practical to do so. Please bring your glasses, if you need them, and a pen, notebook and camera if you wish to document the process. If you have, bring an old bedsheet and 1 or 2 big bin liners to wrap the basket up while moist at break time/overnight. Hannah Ehlert has successfully run creative green-woodworking courses for the last 11 years. These included hazel wattle hurdles, Swedish spoon- and wood carving, baskets, wood projects for children. During her three year- coppice worker apprenticeship she has trained with a variety of craftspeople. She has worked in schools as well as with adults. 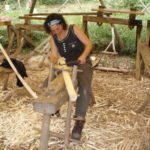 She also runs family and adult Deep Nature Connection courses and works as a qualified Forest School practitioner.